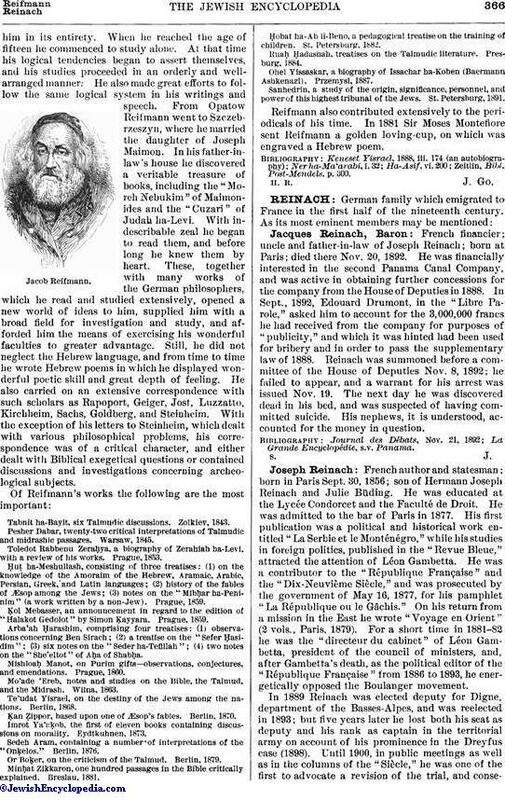 Russian author and philosopher; born April 7, 1818, at Lagow, near Opatow, Russian Poland; died at Szczebrszyn Oct. 13, 1895. Up to the age of six he received instruction in Hebrew from his father, whom circumstances had forced to become a "melammed"; after that age he studied Talmud under different rabbis of Opatow, to which town his family had removed from Lagow. The most prominent of his early teachers was R. Meïr Ḥarif, but the instruction he received was very unsystematic. Passages for discussion were selected at random from different parts of the Talmud, and during the nine years of study under these rabbis not a single volume was read byhim in its entirety. When he reached the age of fifteen he commenced to study alone. At that time his logical tendencies began to assert themselves, and his studies proceeded in an orderly and wellarranged manner: He also made great efforts to follow the same logical system in his writings and speech. From Opatow Reifmann went to Szczebrzeszyn, where he married the daughter of Joseph Maimon. In his father-in-law's house he discovered a veritable treasure of books, including the "Moreh Nebukim" of Maimonides and the "Cuzari" of judah ha-Levi. With indescribable zeal he began to read them, and before long, he knew them by heart. These, together with many works of the German philosophers, which he read and studied extensively, opened a new world of ideas to him, supplied him with a broad field for investigation and study, and afforded him the means of exercising his wonderful faculties to greater advantage. Still, he did not neglect the Hebrew language, and from time to time he wrote Hebrew poems in which he displayed wonderful poetic skill and great depth of feeling. 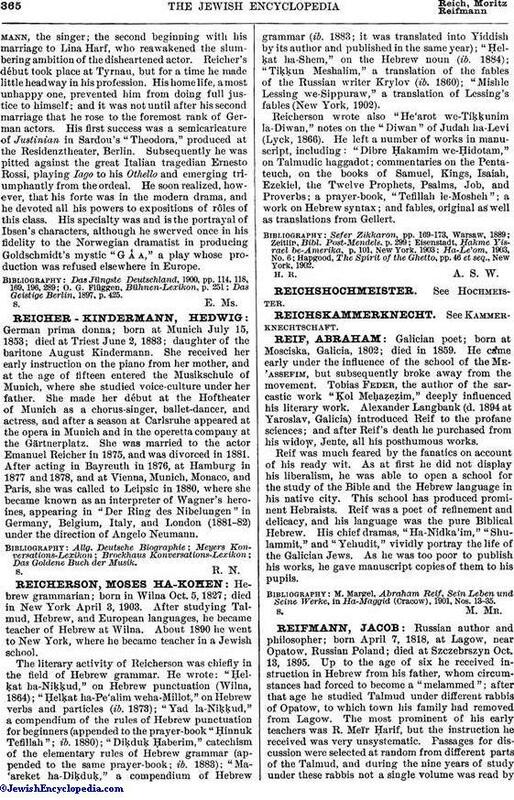 He also carried on an extensive correspondence with such scholars as Rapoport, Geiger, Jost, Luzzatto, Kirchheim, Sachs, Goldberg, and Steinheim. With the exception of his letters to Steinheim, which dealt with various philosophical problems, his correspondence was of a critical character, and either dealt with Biblical exegetical questions or contained discussions and investigations concerning archeological subjects. Tabnit ha-Bayit, six Talmudic discussions. Zolkiev, 1843. Pesher Dabar, twenty-two critical interpretations of Talmudic and midrashic passages. Warsaw, 1845. Toledot Rabbenu Zeraḥya, a biography of Zerahiah ha-Levi, with a review of his works. Prague 1853. Ḥuṭ ha-Meshullash, consisting of three treatises. : (1) on the knowledge of the Amoraim of the Hebrew, Aramaic, Arabic. Persian, Greek, and Latin languages; (2) history of the fables of Æsop among the Jews; (3) notes on the "Mibḥar ha-Peninim" (a work written by a non-Jew). Prague, 1859. Ḳol Mebasser, an announcement in regard to the edition of "Halakot Gedolot" by Simon Ḳayyara. Progue, 1859. Arba'ah Ḥarashim, comparising four treatises: (1) observations concerning Ben Sirach; (2) a treatise on the "Sefer Ḥasidim"; (3) six notes on the "Seder ha-Tefillah"; (4) two notes on the "She'eltot" of Aḥa of Shabḥa. Mishloaḥ Manot, on Purim gifts-observations, conjectures, and emendations. Prague, 1860. Mo'ade 'Ereb, notes and studies on the Bible, the Talmud, and the Midrash. Wilna, 1863. Te'udat Yisrael, on the destiny of the Jews among the nations. Berlin, 1868. Ḳan Ẓipper, based upon one of Æsop's fabies. Berlin, 1870. Imrot Ya'aḳob, the first of eleven books containing discussions on morality. Eydtkuhnen, 1873. Sedeh Aram, containing a number of interpretations of the "Onḳelos." Berlin. 1876. Or Boḳer, on the criticism of the Talmud. Berlin, 1879. Minḥat Zikkaron, one hundred passages in the Bible critically explained. Breslau. 1881. Ḥobat ha-Ab li-Beno, a pedagogical treatise on the training of children. St. Petersburg. 1882. Ruaḥ Ḥadashah, treatises on the Talmudic literature. Presburg, 1884. Ohel Yissaskar, a biography of Issachar ha-Kohen (Baermann Ashkenazi). Przemysl. 1887. Sanhedrin, a study of the origin, significance, personnel, and power of this highest tribunal of the Jews. St. Petersburg, 1891. Reifmann also contributed extensively to the periodicals of his time. In 1881 Sir Moses Montefiore sent Reifmann a golden loving-cup, on which was engraved a Hebrew poem. Zeitlin, Bibl. Post-Mendels. p. 300.